Hi, I love your little trailer. I have been working toward talking my husband into purchasing a secondhand travel trailer and just giving it a try. I’m retired but he has a few years left to work, but has pretty good vacation time, so we are just thinking about in state travel for a while to get our feet wet. I’m looking forward to sharing your adventures through this blogging media and showing Steve just how much fun we can have. God bless your travels, Connie P.S. please accept my invitation to visit my blog, hopefully you will decide to follow me, too. 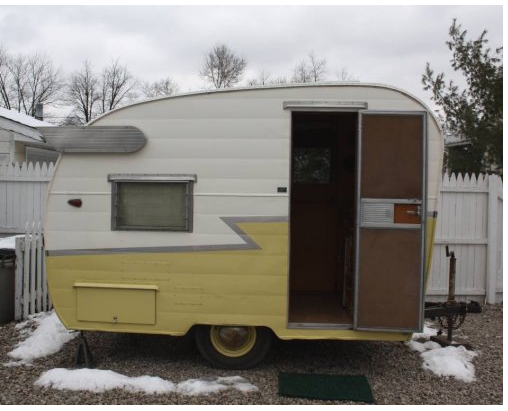 Hi…Love your cute little camper , Love the style, Do you have pics of the inside? and where are you located? Katie, I stumbled upon this post tngoiht, and what a sweet blessing it was. Such an incredible reminder of where our true home is. Bless that dear family and bless you for sharing your talent with the world! Hope you are well.